RancherMan loves his iced tea. I love that it’s a healthier drink option for him than many other choices. And brewing our own tea means no trash. Plus it’s super cheap. But did you know it doesn’t necessarily have to be hot outside to brew tea? All you really need is sunshine. There are a couple of ways I’m able to provide RancherMan with that delicious beverage he loves. Brewed in winter or summer: No purchased energy necessary! I’ve written before about how I use Passive Solar Principles in our home. This allows me to use the sun to my benefit in many different ways. Brewing my tea is a helpful way I can harness the power of the sun for FREE! 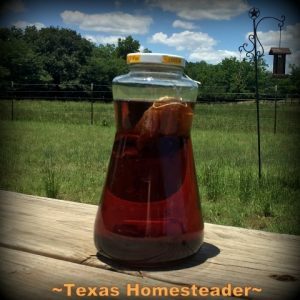 I typically brew our tea in a Repurposed Jar I specifically use for brewing tea. It’s hourglass shaped to make it easy to safely carry to & from our picnic table in the back yard. Then I just let the sun do its thing. But did you know it doesn’t have to necessarily be hot outside to brew tea? All you need is sunshine. So even in the colder winter months there are a couple of ways I’m able to provide RancherMan with that delicious beverage he loves. I often just put a tea bag in my hourglass jar with some filtered water and set it on the picnic table in the sun. Of course during the summer months it brews pretty fast! But even in the winter months I get my tea brewed, it just takes a little longer. How does that work? Well, you know how warm the inside of your car gets when it’s parked in the sun, even in cold weather? That heat from the sun comes through the windshield & is trapped in the car. Well this glass tea-brewing jar accomplishes the same thing. So even in cold weather, your tea will get brewed! I just leave it in the sun until it’s the color I want and then bring it inside. I’ll pour it into our glass pitcher, add another jar of filtered water and BOOM! Sun Tea. I like my tea unsweetened so it’s typically prepared that way initially. 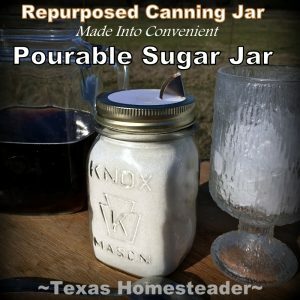 If RancherMan wants it sweet he’ll add sugar from the Pourable Sugar Jar I made. He loves that jar – sweetening his tea is now so easy. And I simply used a Repurposed Spout from an empty box of salt to make it in minutes. Yea Repurposing! If the wind is low and I’m in a hurry I’ll bring out my *Solar Oven. I just leave the lid unlatched so it gets nice & hot inside the oven without getting TOO hot for brewing my tea. MAN I love my solar oven! I can bake bread in it, cook casseroles, or dehydrate food. Winter or summer, it doesn’t matter as long as the sun is shining. Did you know you can actually make ‘boiled eggs‘ in the solar oven, cooked right in their cardboard carton! Whaaa…???!! Yep, it’s true! By the way, if you’ve been considering a solar oven for yourself the Sun Oven folks are offering a pretty nice money-saving coupon just for my readers. Help yourself! 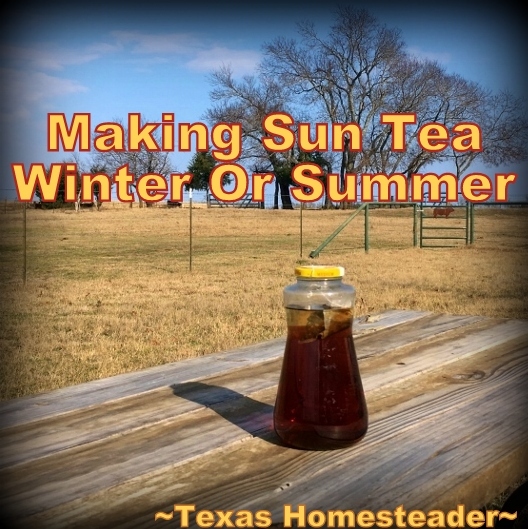 So I’ve shared a couple of easy ways to make your sun tea. Making it outside using only sunshine uses no purchased energy – winter or summer, hot or cold weather. And if you’re doing your brewing in the summer months it really helps to keep that heat & humidity outside where it belongs #amiright?? 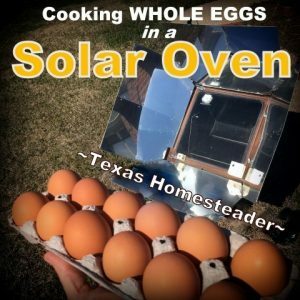 This entry was posted in Blog Posts and tagged Frugality, Make-It-Yourself, Solar Cooking on March 21, 2019 by Texas Homesteader. Ive seen this before, I never remember to do it though. This year I have to remember! Looks like such a good, fun idea. After a few times of taking tea outside to brew I gave that up. Now I simply leave it on the kitchen counter. I’m usually using a variety of types of herbal (I know even black tea would be considered herbal) tea. I just plunk them in the pitcher and leave it on the kitchen counter until it’s ready to stick in the refrigerator. We each sweeten it to our own tastes.